Want better workouts? A bullet-proof race plan? 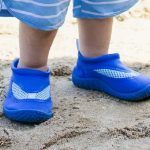 Less anxiety behind the blocks? Yup—the simple act of journaling can help. Big time. Here’s how. Journaling is more than just about gossiping about your crush at school. Or complaining about your parents. Or recounting the day you had. Journaling is a weapon that can be called into use to significantly improve your swim practices, help better plan and execute your goal race, and even help you to squash anxiety before you step up on the blocks. Here’s three ways to use journaling to become a superior swimmer and put a whipping on your personal best times. Journal out your ideal workout. 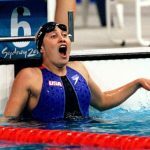 Swimmers have a tendency to be exclusively in react-mode to their swim practices. They walk out on deck and only react to whatever kind of horror and hilarity that coach writes out on the whiteboard. 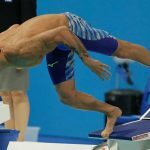 For a moment ignore the surprise test set or the last minute timed 500 freestyle kick, or the bubbling cauldron of flying arms and legs that typically comprises your lane at practice, and imagine what your perfect workout would look like. Better yet, spend ten minutes writing about it. Everything from the mental approach you take to the practice. How you react mentally to that tough set. The way you encourage your teammates in moments of adversity. 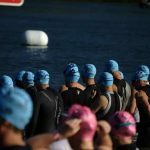 Don’t focus on results necessarily, but how you are going about the practice, how you feel in the water, and the things you are focusing on while training. This is a type of visualization tool, but I would argue that it is even better. 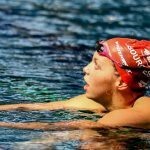 Mainly because visualization can be tricky for swimmers who are new to it; it requires patience and practice to get good at it, and it’s hard not to slide into thinking about the crappy things that might happen in practice. Not feeling fast. Not swimming fast. Getting lapped by a teammate. And so on. 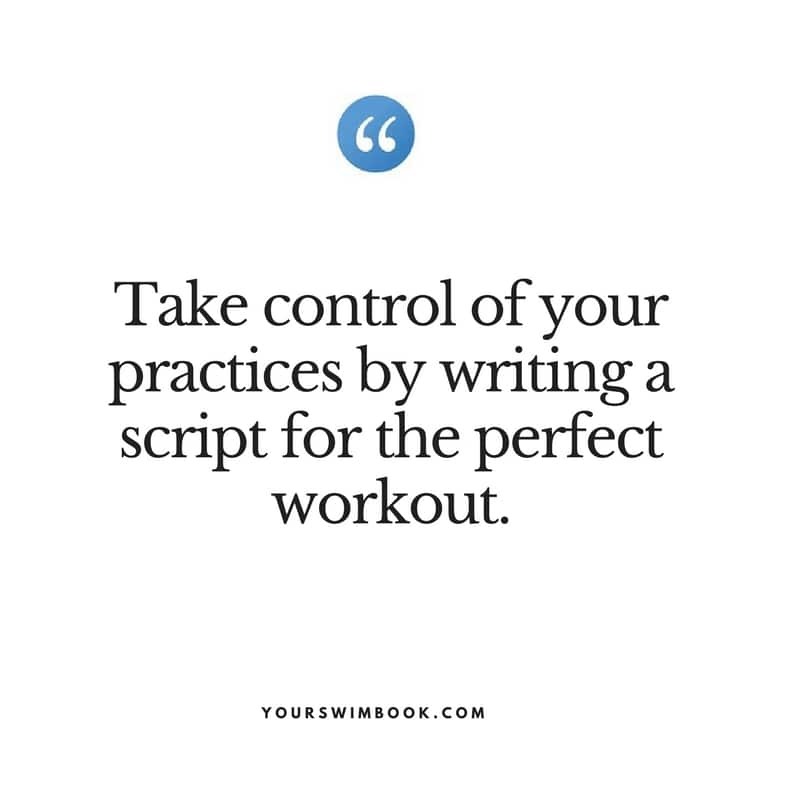 Writing down the process of a killer practice gives you full control, and provides a clear script to follow when you step out on deck. Journal out your perfect race. One of my favorite things to ask of swimmers is to write out their perfect race. It can be as detailed and as lengthy as you like, and it never ceases to impress me the detail that can be employed when performing this exercise. 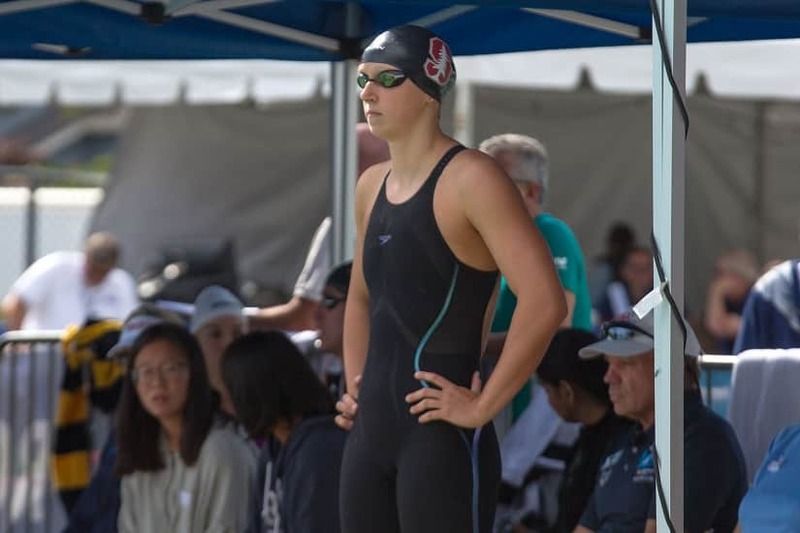 In one case, a swimmer detailed from the last swim practice before taper starts to the car ride home after the meet is over. Start with a quick summary of your preparation over the course of race day. The way you perform your meet warm-up. The pre-race routine you use. The self-talk that you use behind the blocks. How you react to the sound of the starter’s gun. How your body feels over the course of your race. Your mindset in the water. The self-talk you use during your race. Your emotional state before the race. Concentrate on just the things you can control. Read that again. No results. No placings. Just focus on the stuff you want from yourself and your swimming. It can and should be a mix of what has worked for you in the past, and what your ideal race looks like. You can use previous races where things went well to give you some ammo for this exercise—what kind of mindset did you have prior to the last time you swam like gangbusters? The main goal with this little exercise is to give you a series of performance cues and lines of self-talk to use to insure that you are mentally prepared to drop the hammer on race day. 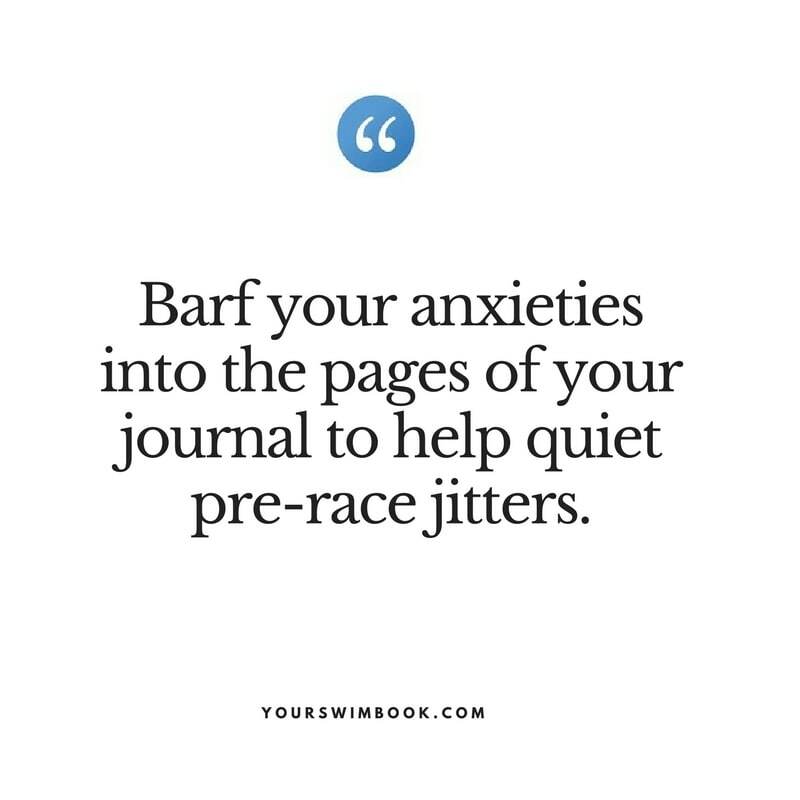 Journal out your pre-race nerves. Ever have moments where you are simply too nervous behind the blocks? This state, while good in moderation (like just about everything in life, it seems), can leave us feeling as though we are unraveling right before our race. You are worried about how fast the competition swam in prelims. How your warm-up didn’t feel “exactly” right. How important this race is to potentially getting recruited to swim in college. You see how tense your coach and parents are, and it makes you even more nervous. Good grief! In order to see how effective journaling could be in quelling anxiety, researchers took a group of students right about to write a high pressure math exam and had them quickly write out their thoughts and feelings on the test ahead. Those that wrote about a random past experience (the control group), were significantly out-performed by the students who took a few minutes to pour out their anxieties and fears about the upcoming test on paper. These results were replicated in four other similarly-designed studies, showcasing the performance anxiety-reducing benefits of quickly putting pen to paper. The best part about this little tactic? You don’t need to practice it, unlike most other mental training tools and techniques. It’s something you can quickly pull out of your arsenal when necessary. We live in a world where we have a wild amount of technology and data at our fingertips. New suits, swim goggles and supplements are marketed as being the next great thing. And the promise of being better, faster, and mildly better looking are heaped on us daily. 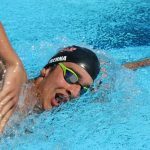 But it’s good to know that one of the simplest tools out there, your basic notebook and pen, still has the power to radically transform the way you swim both in practice and in competition. Put pen to paper, and let me know how it goes via the (free) newsletter below. 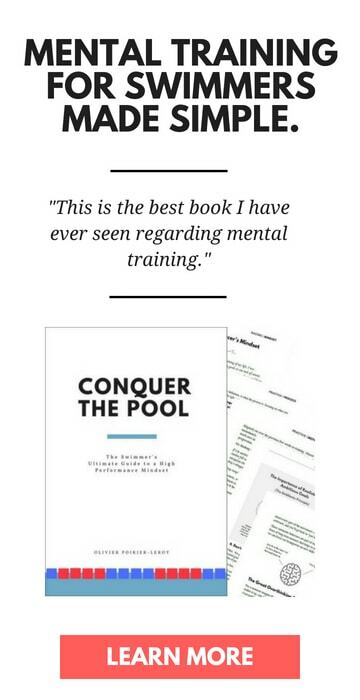 I’ll also send you a PDF with 33 swim workouts just for signing up. Boom. 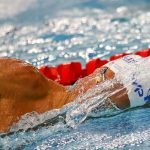 3 Ways to Stay Focused and Calm Behind the Blocks. 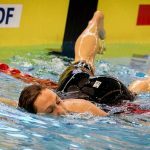 The way we experience anxiety and how focused we are behind the blocks has real effects on our performance in the water. Here’s three things you can do to stay focused and control your anxiety levels. Hey Coach: Why Should I Track My Workouts? Recently I got an email from a young swimmer asking whether he should start writing out his workouts. Here’s an expanded version of my answer.